Nikon just released a new firmware for their D800 and D800E digital cameras as well as an accompanying update for the Communication Unit UT-1. The list of changes is quite impressive though focus is mostly on small usability improvements. Custom Setting f13 has been changed to Assign Movie Record Button. With Custom Setting f13 changed to Assign Movie Record Button, Assign MB-D12 AF-ON is now Custom Setting f14. Custom Setting f15: Assign Remote Fn Button has been added. The following functions have been added or renamed when the D800 is used with the Communication Unit UT-1 running firmware Ver. 2.0. A Network (UT-1) option has been added to, and Wireless transmitter has been renamed Wireless transmitter (WT-4) in, the setup menu. Use to view the pictures on the camera memory card, or to take photographs, from the web browser on a computer or iPhone. Use to upload photos and movies from camera memory cards, or to upload photos as they are taken, to an ftp server. Use to upload photos and movies from camera memory cards, or to upload photos as they are taken, to a computer. Use to control the camera from a computer running Camera Control Pro 2 (available separately) and save photos and movies directly to the computer. To enable support for these functions, Communication Unit UT-1 firmware must be updated to Ver. 2.0 or later, and the Wireless Transmitter Utility must be updated to Ver. 1.5.0 or later. When camera firmware is updated, network profiles specified with earlier firmware versions cannot be used. Network profiles must be created again. Support for the updated version of Communication Unit UT-1 firmware has been added. Support for CompactFlash memory cards with capacities greater than 128 GB has been added. When AF-ON only was selected for Custom Setting a4 (AF activation) and the AF-ON button was pressed to initiate autofocus during viewfinder photography, focus remained locked even after the user took their finger off the button, and the shutter could be released at any time. However, specifications have been modified so that the shutter cannot be released under the following conditions if the camera fails to focus. When values for 12 or 18 lenses were stored with AF fine-tune > Saved value in the setup menu, only some of the lenses for which values had been stored were displayed under List saved values. This issue has been resolved. When the live view selector was set to live view photography with Custom Setting g4 (Assign shutter button) set to Record movies, a value for preset manual white balance could not be measured. This issue has been resolved. When the built-in flash was set to Commander mode, remote Speedlights sometimes did not fire. This issue has been resolved. In some rare cases, the memory card access lamp remained lit for longer than usual, and some time was required before any operations could be performed. This issue has been resolved. The following functions have been added or renamed when the UT-1 is used with the D800 or D800E running A and B firmware Ver. 1.10. 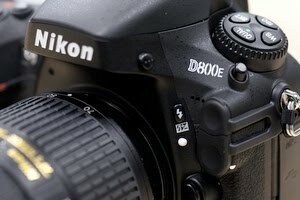 NOTE: To enable support for these functions, D800 or D800E firmware must be updated to A and B firmware Ver. 1.10 or later, and the Wireless Transmitter Utility must be updated to Ver. 1.5.0 or later. When D800 or D800E firmware is updated to A and B firmware Ver. 1.10, network profiles specified with earlier firmware versions cannot be used. Network profiles must be created again.